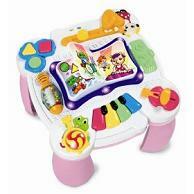 Big sale on the LeapFrog Learn & Groove Musical Table. List price of 44$, previous discount of 35$, but the current sale is at 19$ after check out! Well made table for a toddler learning to stand and explore English and Spanish while doing so. Kids love it.